How did a kid from an Oklahoma cattle ranch sail around the world and become an author? I was born in the winds of Oklahoma. Childhood was spent in the red-dirt and gyp rock canyons of what is now Roman Nose State Park and with family on the Cronkhite Ranch. The land, as far as I could see, then walk, then ride my horse--was home. At 21, in moonlight, I first saw the ocean. At 31, I went sailing. The experience lit a fire. 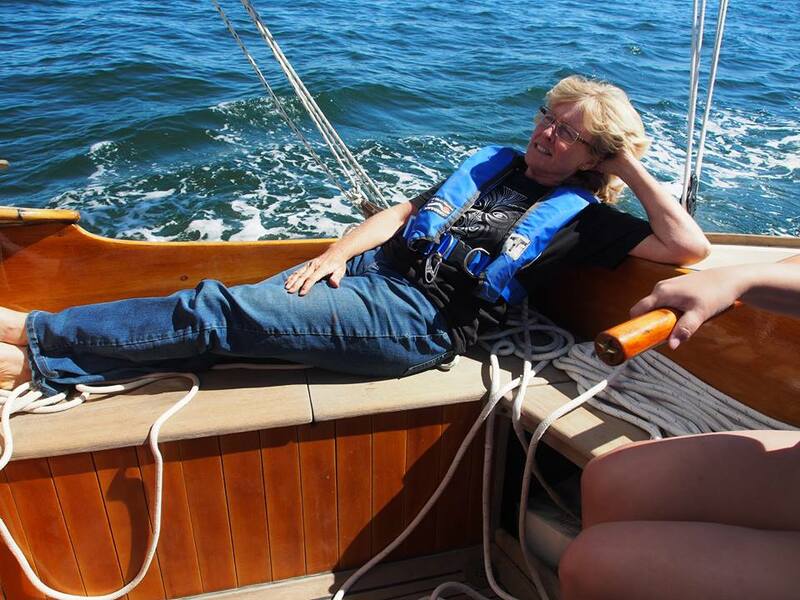 By 40, I sailed more than 60,000 miles - including work as First Mate/ relief skipper on Nancy Erley's TETHYS, teaching women offshore as we circumnavigated the world. and help people find and share their journeys in a variety of ways--from Wooden Boat Festivals to daily posts, to sharing a sail on oceans of the world. I hope it inspires you to... "Live while you're alive!" my 1936 Danish built "spidsgatter" (double-ender sailboat) from our homeport in Port Townsend, Washington and on the Salish Sea in the beautiful Pacific Northwest. What's the latest? Connect and find out! So much has happened since my first book's first talk and signing event, September 2016. Big thanks to the Jefferson County Historical Society, Imprint Books, and the Wooden Boat Chandlery at NW Maritime Center in Port Townsend for their overwhelming support over the years. Next up, Adlard Coles/Bloomsbury who now bring my books to a world-wide audience. I have and enjoy presenting to anyone who loves stories of travel, history, boats, and following inspirations. I speak in bookstores, bookclubs, boating events, schools, retirement homes, professional associations, and libraries—so far, in 26 states and 4 countries! Booking now for Fall 2018 and all 2019. For information, contact. Follow @kacicronkhite on Instagram, on Facebook, on Twitter @KCpax, and at Pinterest. For consulting project availability, see LinkedIn. Designed by MSJ Hansen and built by Karl Thomsen. The only Danish spidsgatter this size in North America. Pax (peace in Latin) is a 28' double ender—45m2 spidsgatter in Danish classification. She was built in Kalundborg, Denmark, 1936. Those facts, along with almost 70 years of history in Denmark, Canada, and California were missing when, in 2007, Kaci Cronkhite (who "knew better than to buy a wooden boat") opened an email and fell in love. After a 6-month unexpected "haulout from hell" in Port Townsend she began a 7-year search that has been described as a love story, a quest, and an adventure. Along the way, she met a mystery woman boatbuilder in Canada; a musician in Sausalito; learned of a tragic fire that nearly destroyed the boat in California; came up short in Los Angeles "where boats go to die"; and, met three generations of four owners' and the builder's families in Denmark. Finding PAX is the remarkable story of that quest. A new 2nd edition of the book will be released by Bloomsbury in Fall 2018! Until then, follow the latest news about Spidsgatter Pax on social media and sign up here for information on the book release and Upcoming Events. PAX is moored year-round at the Port of Port Townsend's Boat Haven Shipyard, B Dock. Open daily for tours during the Port Townsend Wooden Boat Festival. To see the boat at other times and locations, see Upcoming Events or contact Kaci. the inexplicable joy of wooden boats. Wooden Boat Festivals are like the best reunion, on-the-water concert, antique show, adventure-lover's beer party, weekend learning and inspiration retreat, and holiday church service combined! Seriously, if you haven't been to one... start in Port Townsend, Washington or Mystic Seaport, Connecticut or down-under in Hobart, Tasmania and you'll never regret it. The stories will warm your heart and the beauty will inspire you for the rest of your life. You don't have to know a thing about wooden boats to enjoy them or quickly sense what it is that makes these wooden works of art so inspiring to people all over the world, regardless of age, gender, religion, aptitudes, or any of those other pesky dividers. Wooden boats bring people TOGETHER! Bring what you've got: curiosity; your unique expertise; an old photo of your grandpa's boat; your dream to build, to get out on your local waters, or sail around the world. At Wooden Boat Festivals, you'll be among friends. Me and (sometimes, where possible) my 1936 Danish spidsgatter (fancy word for double-ender or more precisely two-butts! ;) named PAX, participate in Wooden Boat Festivals all over the world. Here are some of my favorites. When possible, I go every year... or every year these happen! Check Upcoming events for my latest schedule and if you've got recommendations or want to send an invite, contact me! Largest, first, and many say the best (But hey, I love 'em all, so it's sorta the best of a whole cart of desserts.)... due to the intersection of world-wide talent that unites here every years... in North America. More than 200 wooden boats of all kinds are packed together and available for boarding while more than 100 educational demonstrations surround them on the campus surrounding the marina. More than you can possibly see and do in three spectacular, jam-packed days. Includes nearly 100 maritime exhibitors, from tools to books to clothing and educational programs, plus live music, unique kid activities, fine local food, and brews. The first, the largest and the most international wooden boat event in North America. Held annually the first weekend after Labor Day in September. Book your accommodations early and buy tickets online. Visit their website. Largest "purely" wooden boat gathering in the world! If you're in the northern hemisphere, keep in mind that the timing gets you out of our winter, into their lovely summer! 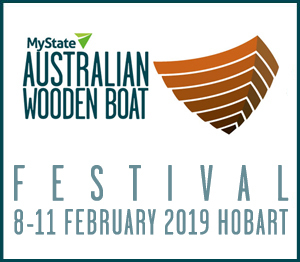 More than 500 wooden boats of all kinds fill the historic Hobart waterfront docks. Most are available for boarding. Set in the heart of the city, the Festival vibe permeates the surrounding parks, shopping, eateries and pubs. World class wooden boat speakers, music, art, foods and wine. Held bi-annually every odd year. Next event is February 8-11, 2019. Book accommodations early through their outstanding travel company. The event is FREE. Visit their website. More than 100 wooden boats of all kinds are moored along the docks or displayed on land in the spectacular Mystic Seaport Museum venue. A year round 'living' museum, Mystic is one of the top destinations for wooden boat enthusiasts worldwide. 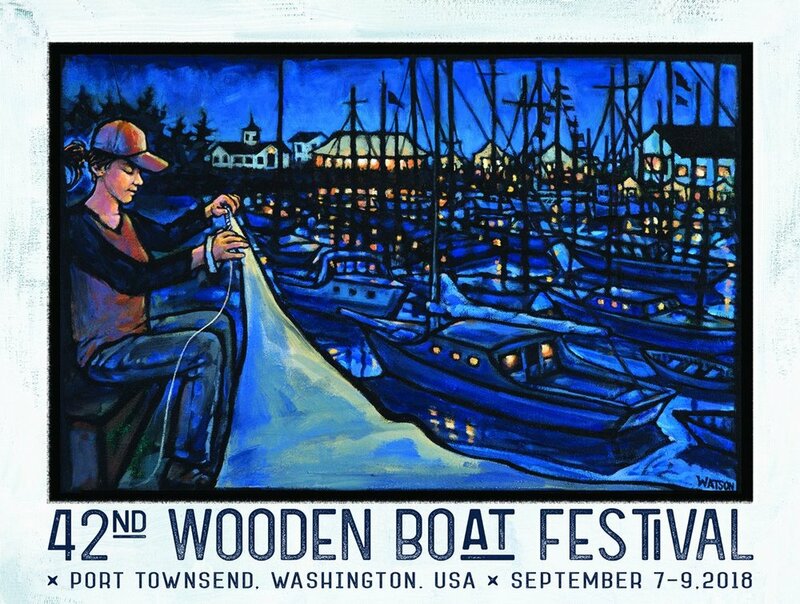 Couple that venue with the staff and friends of the top wooden boat magazine in the world, WoodenBoat and you're guaranteed an event like no other - rain or shine. 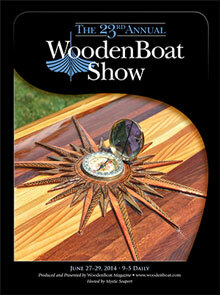 Exhibitors range from folk art to top purveyors of wooden boat products. Magazine and book authors are on hand all weekend. Held annually in June. Tickets required. Visit their website. More than 2000 wooden and history vessels of all kinds and from all over the world fill the historic naval harbors of Brest (watch the video) ever four years and hundreds fill the quaint natural harbor of Dournanenez every two years. Considered the "Mother of all Wooden Boat Festivals," Brest Festival of the Sea draws more than a million people. 18th century traditions, skills, tools, songs and sailor lore imbue this event with unmatched salty flair. Next Brest event is July 2020. Visit their website. More than 150 wooden boats of all kinds fill the historic waterfront harbor of Vancouver Island's most charming little city. In the shadow of the Empress Hotel and adjacent to pubs, restaurants, shopping, island tour companies and the world class BC Museum. The event is held annually one week before the Port Townsend WBF and is FREE. Visit their website. VIDEO: 2009 Risor Wooden Boat Festival. More than 150 wooden boats pack the waterfront of this historic Norwegian seaport community. The festival draws the largest crowd to the community all year and includes all the usual range of activities you find at older wooden boat events but with authentic focus on Scandinavian culture, skills, food, music and craftsmanship. The event is held annually. Next event is August, 2018 and I'm finally going to make it! Tap wood. Visit their website. Ask a question or let Kaci know you'll be there! 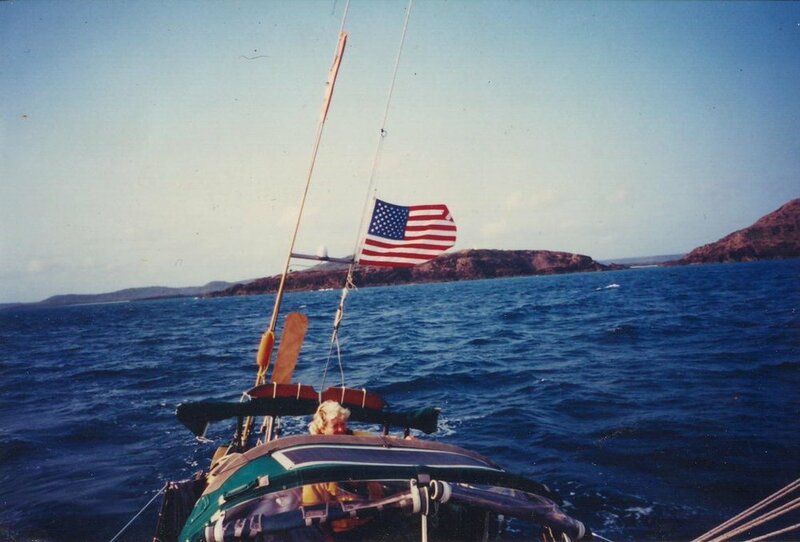 How does a girl go from childhood on a cattle ranch in Oklahoma to sailing around the world? The first time I stepped aboard a boat, I was 31. The rocking motion felt like a horse. Things broke and I could fix them. And then, there was the wind. Always, the wind. One sail led to pursuit of a Ph.d.. The doctoral research led to three progressively longer ocean voyages: an overnight sail from Kauai to Honolulu; a three-week delivery from Honolulu to Seattle; a six month passage from Australia to Hawaii via New Zealand, Cook Islands and Tahiti; and, in 1995 I joined Captain Nancy Erley on Tethys (a 38-foot custom fiberglass sloop) to teach women on long ocean passages. I never expected to sail around the world, but before I was 40, I did. This is my next book, a prequel to Finding PAX, available worldwide from Bloomsbury, Fall 2019!